Kinetiscopes – A Lost Paradise? 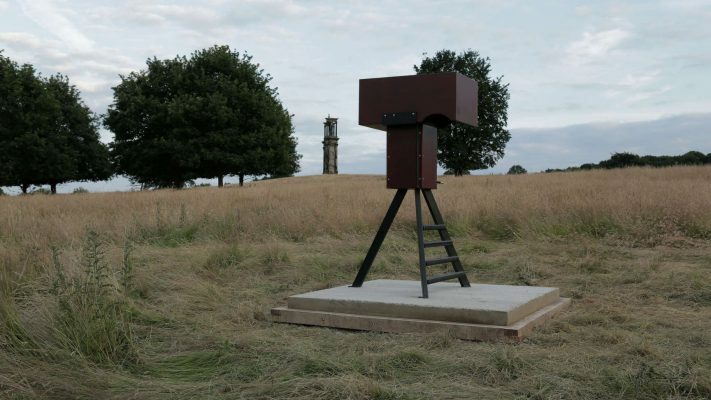 We have been working with Ben Wigley, an artist and film maker, to produce some interactive artworks for his artists residency “A Lost Paradise?”. 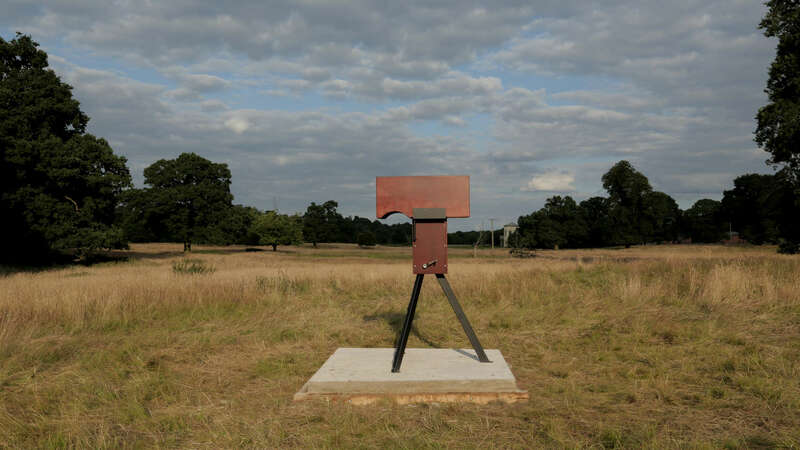 These three units are now installed at Shugborough Hall, a National Trust property in Staffordshire. These units are hand-crank powered film projectors. They use the human power from driving a hand crank to power a section of around 2-3mins of real physical film. 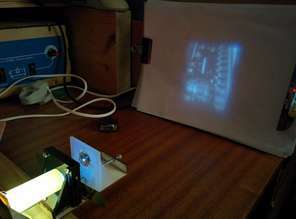 This is driven by a stepper motor along with some bright LEDs and an adjustable lens to throw a projection of the film onto a screen in front of the viewer. 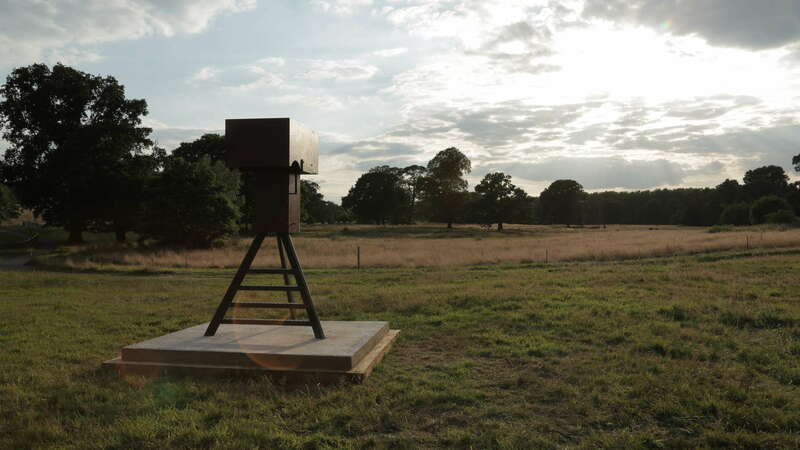 The projection units were built into metal and wood constructions and three were placed within the landscape of the grounds of Shugborough Hall. They are located near to the sites of buildings that were damaged or destroyed by a large flood in 1795. They have been left in the location ready for people to discover. They also have a sound track (saved onto a small mp3 player) that is triggered at different points within the film. 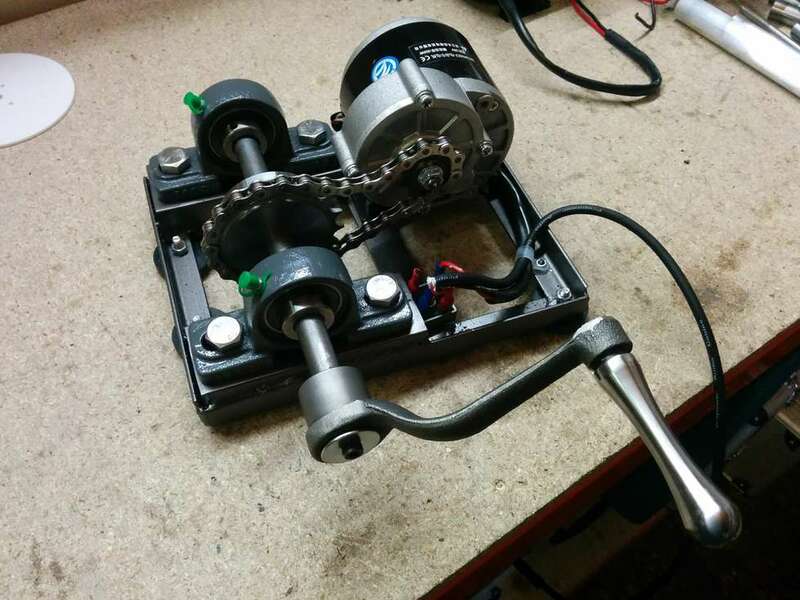 The final hand crank power supply unit. We found we could get around 20-30 W of power from a reasonable, but maintainable, effort. 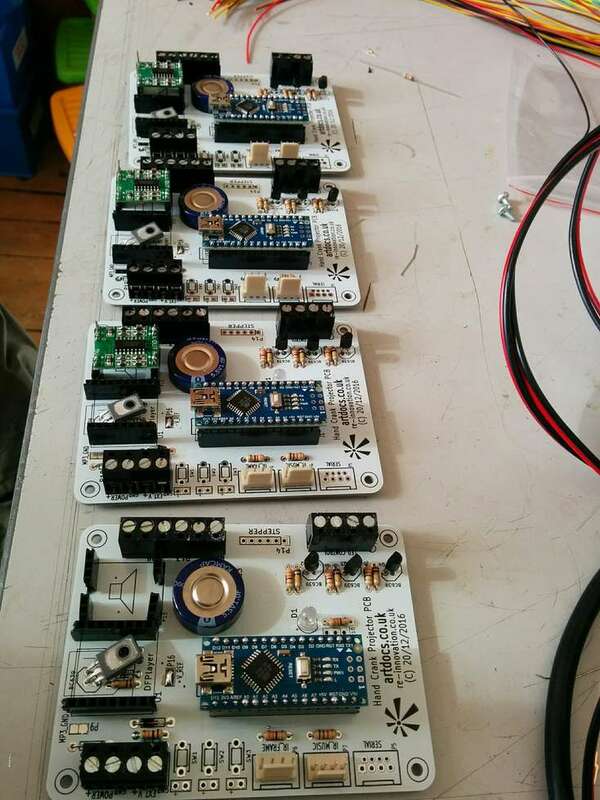 Bespoke PCB’s were designed and ordered. They have an Arduino Nano as the ‘brain’ with a small MP3 player and amplifier. 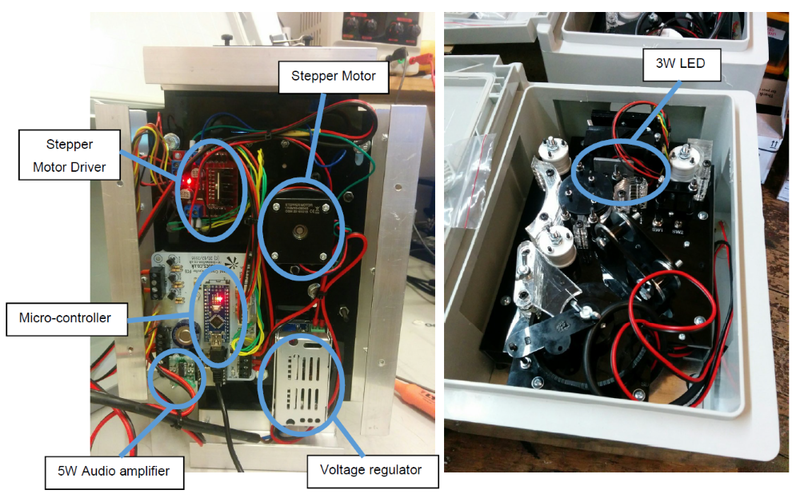 These also control the stepper motor drivers, the bright projection LED and two IR sensors for film and sound sensing. 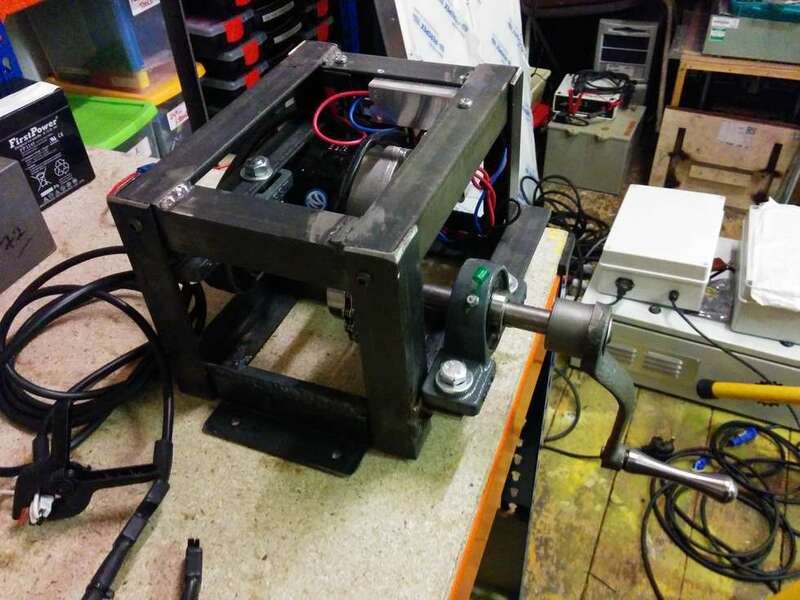 Code was developed to run the stepper motor until the next frame is seen. At this point the film stops and the light is switched on. the unit then runs on to the next frame. Along the side of the film is a small bar-code which was printed out and stuck on. This is read by a separate sensor and, depending upon the number on the section, will play the next sample of sound. The projection element used a bright (5W) LED unit and a small glass lens. Focussing was done by slight adjustment of the lens using a screw thread. This section alone took several iterations. As the film was a long loop, we needed to use a ‘looper’ which is a reel of film where one end wraps around the outside, while the film is gently pulled from the centre. This meant we could wrap around 2-3mins of film into a much smaller area. The units are installed for just under two years for this residency. They will hopefully be re-used at different locations and with different film and sound elements. The hardware PCB overview is available here as a .pdf schematic. Please email if you are interested in the PCB files at all.